To get your event listed here please fill out the event listing form. A self-guided walk around the Estate to see the first signs of snowdrops. Follow the snowdrops around the estate on a self-led walk. The best clusters of snowdrops are expected at Blenheim Lawn, Stable Bank and Ilex Grove (weather depending). Please remember snowdrops are a very fragile plant, and stepping around them will likely cause sevre damage. You can help protect them by not standing in the areas of growth or letting young children or dogs into the area. 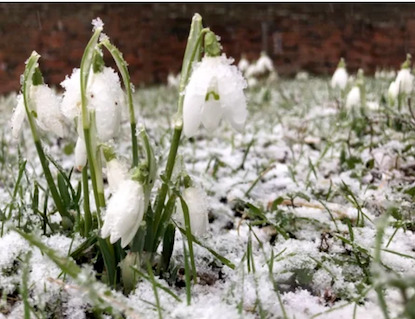 Please call in advance to confirm the status of the snowdrops. On this family trail through the gardens, see if you can find ten Victorian children that used to live at The Vyne. Pick up your 1 trail sheet from Visitor Reception and look out for Martha Chutes ten children in The Vynes gardens. Booking Not Needed. Children must supervise their adults at all times. Dogs on leads welcome. A National Trust Event - Start 10am. End 4.30pm. We are not alone in our ability to view the world in colour. Many species of birds, fish, reptiles, and amphibians have superior colour vision. Yet our ability to be enchanted by colours which illuminate complex patterns, lines and shapes is probably a uniquely human quality. Of all our senses, perhaps our sight is the most precious. Through our colour vision we understand our world. It warns us of danger, makes objects quickly recognisable, and helps us to store and retrieve precious memories. From the earliest cave paintings we have learned to express our feelings and share our thoughts with each other through colour. Open 10am to 3pm. Reading Youth Orchestra are delighted to present our 75th Anniversary concert featuring talented members of our ensemble as soloists. Led by Euon Mallett, the first half will hear solos from flautist Michi Aneez, oboist Abbey Hardy and baritone David Cox. The second half will be the cheerful and full-of-life 8th Symphony by Dvorak, inspired by Czech and Slavonic folk music. The award-winning Trinity Concert Band return to All Saints Church, Wokingham for an exciting concert featuring vocal duet Indigo May (www.indigomayduo.com). Previously members of The Swingle Singers and regular performers on PandO and Cunard cruise lines, these two accomplished sopranos will perform a range of music with the band, including Bring Him Home, West Side Story, All By Myself, The Prayer, and Come What May. In honour of St Patrick�s Day, the pair will also perform a stunning acapella medley of Celtic songs. The band will be performing a number of solo items including a dazzling Queen medley! Featuring a range of music spanning centuries and genres, this is an evening not to be missed! Tickets are priced at �12 in advance or �13 on the door. Children under 16 get free entry. Advance tickets are available via the band website, below. A Joint concert of Reading Male Voice Choir and Abertillery Orpheus Male Choir. Also features Sohpie Baylis as guest Flautist . A great evening full of many different musical delights. Raising Funds for Headway Thames Valley - The brain injury Charity. Concert starts at 7.30pm. No5 presents their Second Annual Young People's Performing Arts Concert - a showcase of the talent from some of Reading's best young people's performing arts groups! Performances from: Berzerk Productions, Starlet Dance School, Conco Dance, Kalakunj, T4C, Reading Boys' School, Queen Anne's School, and choirs and musicians from The Bulmershe School. Doors open: 5:30 pm, performance: 6.30pm- 8.30pm (including interval). Online Ticket Price: Adult �6, Children under 16 �3, under 5's free. On-the-door Ticket Price: Adult �7, Children under 16 �4, under 5's free. Venue is wheelchair accessible. This workshop will look at wills, pre and post 1858, plus other probate documents such as inventories, administrations and death duties. Find out their benefits for family historians and where to locate them. With Tutors: Chad Hanna and Gillian Stevens. This workshop is organised by Berkshire Family History Society. Mary Anning was an overlooked pioneer of palaeontology. As a working class, non-educated woman in the 1800s, she never published her findings but her discoveries paved the way for the modern understanding of our planet's history and the creatures that once roamed upon it. Hear about her life, the amazing creatures she found, and how we are looking to spread her story to inspire a new generation of geologists. Mary�s achievements will be extolled by Dr Katie Cooper, a lapsed geologist, science communicator and badge-wearing STEMinist, who is championing the Mary Anning Rocks campaign which aims to erect a statue of Mary in her home town of Lyme Regis. We will also be rocking with the Sunday Assembly Reading band and getting you to make your own discoveries. After the Assembly, we meet once again at Brewdog ** About Sunday Assembly **Sunday Assembly Reading is free to attend and runs entirely on donations.The Sunday Assembly Reading is a secular congregation that celebrates life, meeting once a month at The Reading Irish Centre. Members of the Assembly believe in Living Better, Helping Often and Wondering More, for no other reason than to make the most of the one life we know we have. RAIN OR SHINE BENSON ANTIQUES FAIR IS ALWAYS ON! This popular quality Antiques and Collectors fair is held on the third Sunday of each month. Benson Antiques Fair is held at the Parish Hall, AA signposted, sat nav OX10 6LZ. 9am-4pm, admission �1.50. Once again the race sets off around the stunning parkland of Green Park, through the beautiful grounds of the University campus and round to the highlights of the town centre of Reading with its huge huge crowd support. The final straight leads into the magnificent Madejski Stadium where 5,000 supporters will be waiting to cheer the runners home. This is a race for the experienced athlete looking for a new PB through to the complete beginner looking for a friendly safe and fun environment to run in. 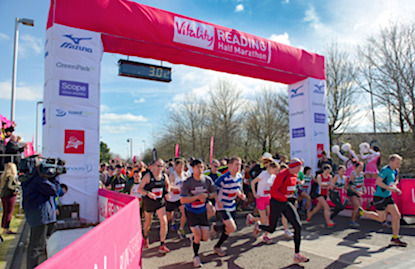 The first ever Reading Half Marathon was organised and run in 1983, when the start and finish venue was Reading University at Whiteknights Park. There were 5,000 runners and it was won by a 21 year old local University student, Mark Curzons in a time of 67.45. In 2003 Sweatshop took over the organisation with the aim of making the event all about the runner and ultimately create an experience that is worthy of this prestigious half marathon. They retain an involvement although the race passed on to the banner to insurance company Vitality, and now accountancy experts Sage. On Sunday, the Supporters' Trust at Reading (STAR) will be inducting another 25 names into the Reading Football Club Hall of Fame on an evening which will no doubt see a host of Royals legends attend the ceremony once again. What is the Hall of Fame? It�s a celebration, a chance to enjoy a slice of our long history and mingle with those who help make the club what it is. STAR aim to induct 150 Reading FC legends by the time the club turns 150 years old in 2021 and the names inducted are spanning every decade of the Royals' existence, with every part of the club's history treated equally and honoured. Compared to other counties in 19th century England, why is there little or no information written about the women of Berkshire? Who were they, what did they do and where can we find out more about them? Find out in this fascinating talk by professional genealogist, Lin Ricketts. A talk to tie-in with International Women�s Day, which was earlier this month. Learn about the fabulous art of silk painting with a local artist. Join artist Helen Mortimer to learn about the art of silk painting. Using iron-fix silk paints you will create a design using gutta (outliner) on to silk; templates will be provided, or bring along your own designs. Your visit supports not only local arts and crafts, but also our work to introduce Sandham to a wider audience. Britain�s most magical circus is returning to Basingstoke with a brand new show that promises fun for all the family. Whirlwind unicyclists, high flying trapeze artistes and flame throwing fire jugglers are joined by the show�s very own Miss Grace Olivia, who puts the �Wonder� into Wonderland in a sparkling show-stopping sensation. Amidst the action and excitement, award winning clowns Kakehole and Mr Popol are returning to scale new summits of silliness, causing chaos with their unique brand of music, magic and mayhem. Blending thrills and spills and side splitting comedy, Circus Wonderland is Number One for Family Fun. Mikhail Shilyaev (on piano) is playing music by Mozart, Janacek, Alistair Jones and Debussy.